Libra likes to be evenly divided, while Sagittarius always strives to reach the limit and takes bold antics in order to brighten up life. But sometimes it is difficult for Libra to move, and Sagittarius does not know when to stop, and therefore some balance is possible between them! Libra have an inner desire to weigh all the options before they act, and Sagittarius is motivated by a spontaneous desire to rush into the battle without thinking about the consequences. Despite all this, Libra and Sagittarius are able to get along with each other - probably because both are extremely accommodating. Libra is always ready to concede to fulfill someone else’s desire, and Sagittarius does not want to get irritated and knows how to turn a quarrel into a joke, and that Libra will soon dance to his tune. As a parent, Libra most appreciate the sense of harmony in the house, and in it with the advent of the jolly Sagittarius there will be no shortage. Libra mom does not regret anything for his Sagittarius, so he will have beautiful clothes, a cozy room and much more toys than he will ever need. She will try to take him everywhere with her, so that he gets as many new impressions as possible. True, she can just pamper him, although an honest Sagittarius will not take advantage of the mother’s kindness, as somebody else could afford. Of course, he sees that she is too soft and she does not have his confidence and perseverance, but he appreciates her reasonable advice. Mom-Libra will always find something to entertain her child. The only thing that he can complain about is that Libra is sometimes too intrusive… But this mother will give him freedom and will not tie her to her skirt. And that, Libra does not like disputes, so the mother prefers to distract the attention of Sagittarius, and not quarrel with him. Sagittarius is more likely to take risks than his Libra mom. He is trusting and frank, full of life and not upset because of; Trifles. A more careful mother is delighted. She herself is friendly and attentive to others, and Sagittarius likes it. True, she finds it difficult to manage with the restless little Sagittarius, and sometimes she discovers that she is just tired, so she needs a rest from time to time. Sagittarius is a fickle and easily addicted nature, and the new idea always seems to him better than the previous one, so that he throws one and immediately passes to the next. Well, Mom-Libra has a different approach: she must weigh everything and only later, slowly, make a decision. She realizes that Sagittarius needs sometimes a firmer leadership and that she must act more decisively and do not let him scatter, trying everything - and not bringing anything to the end. But she helps him, sometimes even unconsciously, to make the right choice, because she gives him the opportunity to feel free. Sagittarius shares the love of Libra’s mother for art and for beauty in general, her good taste, her understanding of what culture is. If he has artistic abilities, this mother will certainly help develop them. At the same time, she will really appreciate his possibilities, but he will never disappoint him. These two love to talk, and my mother will enjoy listening to his enthusiastic Sagittarius and enjoying his creative imagination. He will gladly tell her about all his successes - with all frankness and with the most remarkable humor. And she will be patient with him, but at the same time he will be able to achieve from time to time erratic Sagittarius unusually good behavior! Yes, Mom-Libra and her child-Sagittarius really help each other to discover the best qualities in themselves. These two are probably friends, because Sagittarius’s sun optimism is so clear to his father-Libra. The father knows how to listen to his little dreamer and respond positively to all his plans. Papa-Libra understands that brilliant ideas are like an acute spice to life, and even if they do not lead to anything, one can enjoy only their discussion. Friendly Libra like a candid and fair little Sagittarius, and the father encourages the bright intellect of his child, laughs at his jokes and antics and knows how to support him in time if he stumbled. In general, Libra dad understands children well, especially such cheerful people as Sagittarius. In addition, this child starts talking quite early, so that their communication will be interesting, because Sagittarius asks adults a lot of questions. Nevertheless, sometimes these two are able to act on each other’s nerves. Father - a supporter of reasonable and reasonable arguments, and Sagittarius insistently demands truth, regardless of whether it’s nice to his father or not. If a small Sagittarius find that his father is hiding something from him, but clearly feels internal tension, the child is worried. He would prefer to hear the truth, however painful it may be. 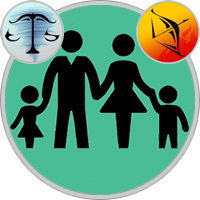 Most of the fathers born under the sign of Libra adore their family, around which their whole life is built, and communicate with their children on an equal footing. This attitude suits Sagittarius. He has enough mature observations, which the father takes with respect. But when they appear together in public. Sagittarius ceases to be an adult. The fact is that it is important for Libra to always have a decent appearance, and Sagittarius is able to behave too freely just to tease his father! But basically these two get along really well. Sagittarius helps Libra cope with indecision and is always ready to share with his father his fun. Well, the father is proud of his child, especially if he sees how easily that soul of any company becomes. And most of all he is happy that they do not have a problem of fathers and children, because they are indeed friends.